Sun Devil backers who knew the situation in late December of '68, and not many seemed to, understood that Kush, having similar emotions as did his predecessor Dan Devine, was frustrated with the lack of recognition and opportunities to play in bowl games despite having bowl-worthy teams. On January 4, 1969, Kush accepted the head coaching position at the University Of Pittsburqh, a relatively thankless task at that point in Pitt football history due to the lack of talented material on hand and a succession of losing seasons. Kush had an abrupt change of mind and returned to ASU on January 9th and was welcomed back with open arms. A third 8-2 season and a WAC Championship with a sprinkling of Big Ten and PAC 8 opponents on the schedule must have made Kush wonder if there was a bowl game in the team's future but talent abounded. The Devils began the year with a 48-26 smashing of Minnesota that included 446 passing yards from QB Joe Spagnola. Colorado State fell 79-7. Art Malone was an All American and broke his '68 school rush record with 1439 yards and earned a ticket to the Atlanta Falcons where he was an excellent back for five seasons, playing two more with the Eagles. Mesa JC transfer Mike Brunson joined Malone for the ’70 season in Atlanta but did not achieve the longer career enjoyed by his brother Larry who also went to Mesa but matriculated at Colorado. Spagnola, named as the All WAC QB was a gutsy leader even without JD Hill who was suspended for the season for disciplinary reasons. The defense stepped up with DT Mike Fanucci who was later featured in an NFL Films Redskins’ piece with George Allen, noseguard Ted Olivo and All WAC DE Junior Ah You the featured stars. Return man Lenny Randle was effective but later became better known for his baseball career with the Texas Rangers, N.Y. Mets, and Chicago Cubs. 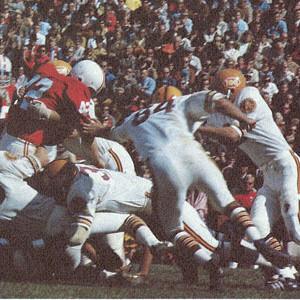 The team looked great in their sunflower gold helmets featuring a one-inch maroon center stripe, three-inch Cardinal identifying “Syracuse style” numerals on the rear of the shell, and unique decal that was placed on both sides of the headgear to pay homage to college football’s one hundredth anniversary. A Cardinal oval with sunflower colored “100” digits, with both the oval and “100” bordered in white which allowed them to stand out beautifully gave the team a terrific look. The Sun Devils looked great and played great ball, certainly among the best in the West but they still were not on everyone's radar. 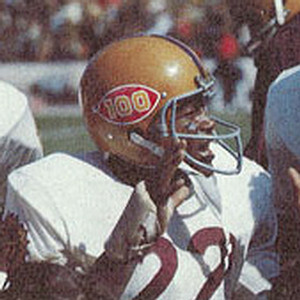 For 1970 the Sun Devils returned to the helmet style they had worn prior to the 1969 season, removing the commemorative “100 Year” decals and replacing them with three-inch Cardinal numerals on each side. They continued the use of the rounded #6 and #9 as had been used since 1965. If Kush wanted a breakout year, 1970 was it by anyone's definition: 10-0 in the regular season facing a schedule that included Big 8 and PAC 8 schools, a Peach Bowl appearance that resulted in a 48-26 whipping of a very good North Carolina team that had put up more than forty points in four of their games, and a number six and seven post-season finish in the two major polls. The Peach Bowl win made an impression on a national audience that realized that the Sun Devils could indeed stand up to anyone, anywhere as the game was played in blizzard-like, non-Arizona type conditions. The Sun Devils did it without as many big names as usual although "Spaghetti Joe" Spagnola's season-long performance insured that he would be known anywhere and everywhere in the Borough Of Brooklyn. Spagnola was the first in a long line of quarterbacks to bring distinction to State at this position. He completed the season with thirty-five TD passes and his career with an overall 27-4 record and an offensive output that averaged 463 yards and 38.8 points during that time. Little 177-pound Dave Buchanan who later played in the CFL and with Hawaii of the WFL and power back Hugh McKinnis were the backfield weapons with input from a slew of developing players including wingback Steve Holden who led the country with 19.2 yards punt return average and was All WAC, and Brent McClanahan. Bob Thomas was almost lost in the backfield shuffle due to all the talent yet was good enough to split four pro seasons with the Rams and Chargers. James D. “J.D.” Hill was back as a feared receiver and garnered an All America selection on the strength of his sixty-one receptions for 1009 yards and eleven TD’s. He was the Bills number-one draft pick and played well for them for five seasons and two more with the Lions. Calvin Demery manned the other flank. The run game was great because center Mike Tomco was named to his first All WAC team and guard Gary Venturo finished with his second year of All Conference honors and later became one of the better known high school coaches in the state of Arizona. The big three of the defense were DT Mike Fanucci, and DE Junior Ah You who was named All WAC a second year, and DB Windlan Hall a second team All American. The enviable record was achieved with one of their best defensive players, NG Ted Olivo, out with a knee injury. It appeared as if ASU had finally arrived on the national scene. Going into the 1971 season with a milestone record of 100-30-1, Kush would now have every annual result compared to the 11-0 dream season of '70 and comparisons were quick in coming. It must have seemed unfair to the other WAC coaches as the ASU backfield reloaded with sophs Woody Green who was WAC Soph Of The Year with 1620 yards and 12 TD's and Benny Malone, Art's younger brother who turned in 917 yards rushing. Almost lost in the shuffle was 225-pound plunger McKinnis who played four seasons for the Browns and one for Seattle. Wingback Steve Holden, the team MVP and All WAC, was again devastating as a punt returner and rushed for 1155 yards, adding 11 touchdowns. With all of the backfield power, soph QB Dan White who did not initially have a football scholarship but instead entered ASU on a baseball grant, took over for graduated Joe Spagnola and merely threw for 1393 yards and added 15 TD's. All WAC TE Joe Petty was an often used weapon, part of a strong blocking brigade led by two-time All Conference center Mike Tomco. The talent level was so deep that WR Calvin Demery, never a big name, made it to the NFL with the Vikings as did RB Oscar Dragon who played a year with the Chargers. Noseguard Olivo who had missed '70 with a knee injury, came back at guard and had a fine season. Junior Ah You “The Hawaiian Punch”, finished his distinguished college career by being named to a number of All American teams at DE and was a third-time All WAC mention. He went on to a long and award-filled career in the CFL and made their Hall Of Fame. Lockdown corner Windlan Hall had a second All WAC season and then six more in the NFL primarily with the Forty Niners. The result was a Fiesta Bowl win over explosive Florida State in a 45-38 Battle Royale won on Green's two-yard dive into the end zone with seconds remaining, an 11-1 record with only a mid-year loss to Oregon State, and a third consecutive WAC title for the nationally eighth-ranked Sun Devils. A "down year" that almost any school would have loved to attain and a 10-2 record marked the 1972 squad that terrorized the rest of the WAC in winning a fourth consecutive conference championship. The team boasted young defensive talent in linebackers Larry Gordon and Bob Bruenig. Bruenig, a local high school product out of Phoenix Alhambra H.S. led the team in tackles with ninety-one. The offense was "the usual" and set an NCAA scoring record of 513 points while earning their nickname of "Firepower '72", as QB Danny White put up 1930 yards and twenty-one TD's through the air. The backfield was again an elite group with 9.5/100 sprinter and All American Woody Green rushing for 1363 yards and fifteen TD's despite playing with injury in some games, FB Benny Malone, WB Steve Holden, All WAC HB Brent McClanahan who would go on to a productive seven-year career with the Vikings, and under rated Morris Owens. Holden was somewhat overlooked with all of the other talent on the field although he was again the squad’s MVP and a three-time All WAC choice in part due to his devastating punt return ability but the pros knew him well and he was the Browns first-round draft pick, playing four seasons for them and a final one with the Bengals. Center Ron Lou led the great blocking linemen, an All Conference choice who played for the Oilers and Eagles. TE Petty repeated as an All WAC performer. Depite the play of DB’s Prentice McCray who had a seven year career with the Patriots and a final fling with the Lions and Ron Lumpkin who managed the ’73 season with the Giants, Kush was miffed at the defensive yield of 21.8 points per game, a school record, but the inauguration of the WAC Champion Fiesta Bowl in their home stadium and the 718 total yards they ran up against Missouri in a 49-35 victory, made him optimistic for '73. If interested in any of these ASU helmets please click on the photos below.